From the moment you begin this epic journey through Canada and Alaska, prepare to be astounded. Whether you’re on land or sea, this is a life-changing experience. Be swept away by Banff National Park’s beauty and stand before the glacial Lake Louise. Discover the astonishing majesty of the Rocky Mountains as you undertake one of the world’s great rail journeys on the Rocky Mountaineer before visiting Vancouver. Alaska is still a great frontier-land and we introduce you to its many highlights as you cruise on board Holland America Line. Visit Juneau, Alaska’s capital which is only accessible by air or sea, unearth gold rush secrets and witness some of the world’s greatest wildlife in their natural habitats. Scenic offers our guests a range of extraordinary Fairmont hotel stays scattered around the country – opulent and in some of the most extraordinary locations on Earth, you’ll have no trouble feeling like royalty during this journey. Welcome to the Canadian Rockies, where your journey of wonder begins. Upon arrival into Calgary, transfer to Banff where you’ll meet your Tour Director and fellow travellers. Feel like royalty as you check into your mountain or valley view room for a two night Special Stay at the Fairmont Banff Springs, the ‘Castle in the Rockies’. Tonight, enjoy a sumptuous welcome dinner. You’re sure to be swept away by Banff National Park, the first national park established in Canada and a coveted World Heritage-listed Site. Ride the Banff Gondola and take in the magnificent views or take a helicopter flight. Alternatively, enjoy a Bow River float trip, take a guided nature hike, play nine holes of golf or take a relaxing soak in the mineral pools. Or you can also head into the mountains by wagon for a cowboy cookout lunch. Drive through the Rocky Mountains, past mesmerising lakes and towering mountains en route to Lake Louise. Check in for your two night Special Stay in a stunning lakeview room at the opulent Fairmont Chateau Lake Louise. Meet a retired member of the Royal Canadian Mounted Police for an insight into the importance of the Mounties in Canada, past and present. 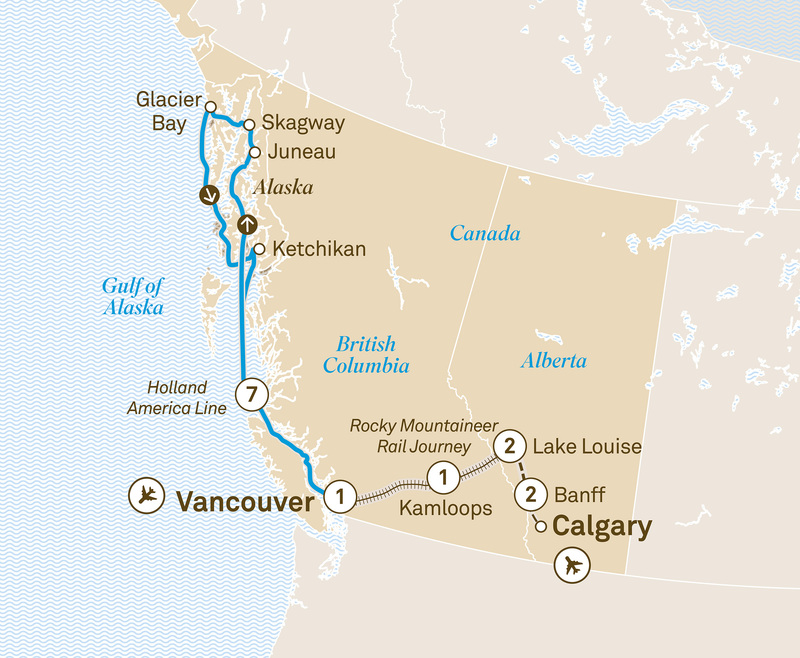 The Rocky Mountaineer is one of the most iconic rail journeys in the world. You’ll relish your two days of GoldLeaf Service as you travel through the Rocky Mountains in luxurious comfort. Gaze in awe as you carve through otherwise inaccessible terrain in the remarkable Canadian Rockies. You don’t have to be an engineer to delight in the ingenious construction of the spiral tunnels you’ll venture through. Stay overnight at a Kamloops hotel as assigned by Rocky Mountaineer. View the confluence of the Fraser and Thompson rivers from your glass-dome carriage. Rocky Mountaineer is renowned for the delicious cuisine made for you on board. Savour the delectable delights and sip on local wine or beer as you soak up the magnificent scenery stretching as far as the eye can see. Later today, arrive at the exclusive Fairmont Hotel Vancouver. Start the day at the tranquil Capilano Suspension Bridge Park where we have the place to ourselves thanks to Scenic’s exclusive pre-opening access. Then explore the many and varied sights, tastes and sounds of cosmopolitan Vancouver during a city sightseeing tour.Later, join your Cruise Director for your luxurious seven night Alaskan voyage on board Holland America Line’s ms Koningsdam. Keep an eye out for orcas, humpback whales or bald eagles from your Verandah Stateroom. It’s a great day to settle back and relax with a book or explore the ship’s facilities, restaurants and lounges. Alaska’s charming state capital is only accessible by air or sea. This is one town you can explore knowing you’ll never get lost. Take a stroll into the past. Historic shop facades, wooden boardwalks and echoes of the gold rush typify Skagway, the gateway of the Klondike. A steaming cup of soup or even hot chocolate will keep you toasty warm as you are mesmerised by the dramatic ice walls of Glacier Bay National Park. A National Park Service Ranger will interpret the natural wonders and wildlife around you. Alaska’s last port of call is known as the ‘salmon capital of the world’. Take full advantage while you’re there. Today, relax and enjoy your cruise southwards. Staring in Victoria, discover the spectacular Rockies. Journey on the Rocky Mountaineer in GoldLeaf & stay at the iconic Fairmont Chateau Lake Louise.